I know that teams and collaboration are all the rage. That's great for people who need that. I don't as a solopreneur. So I find the prominent Share button on notes now not only a distraction but an unnecessary item. 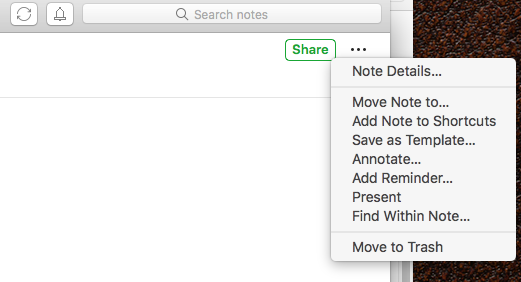 But beside that egregious choice made by Evernote, the greater problem is that with the dot-dot-dot menu you've made Evernote harder to use and me less productive. Now I have to click and look up a menu item to do my function when the functions that I most used, delete a note, require more effort than they did before and should. You made an interface change probably because some designer thought it looked cool and cleaned up the interface a bit but you have sacrificed usability. Shame. Bring back the delete button. It's a simple icon. Or, alternatively, create a tool bar that allows me to customize it and put the features that I want on it that work best for me and my workflow. Evernote has your own ideas of how the workflow and interface should be but it does not work for all of your users, so your approach should be to empower users. Give me the flexibility to make it work the way I want and need. Seriously, Evernote! Give us a delete button! I don't care where the button is, it'd be fine in the toolbar. But a delete button is essential. All of these options require multiple steps that a single button has been able to take care in the past of and should be restored immediately. If this were a UX improvement, I'd be all for it. Instead, removing the delete button makes an extraordinarily important function significantly more complicated. When UX designers get on a high-horse and think they know best what users want, the result is not good design and it's most definitely not human-centered design. I very much appreciate uncluttered design and clean interfaces, but this is really going too far. A point for Windows; you can customize the toolbar. btw I didn't see a delete icon in your Windows screenshot. I use the delete icon in the main toolbar, not the note toolbar. Options for note toolbar are below. Thanks, everyone for your posts. As well. Here is a screen shot of the eff-ed up design that Evernote engineers have thrust upon us. Life was much better with an information icon and a delete icon. Alas I don't have a screenshot of that one because the software updated. I don't care about the Share button in my workflow. And why is it/does it have to be green? I would like to see icons be in notes tool bar to be customized by the users for how they work. Thanks. I suspected as much. Are any of the competitors any better? Maybe it's time to find a new way of working. Well, there are not many alternatives out there if you look at the base feature set of EN. The featureset and the sync-service of EN is actually quite good and I have decided to stick around for one more subscription year. Well said! I could not agree more. We, as users, as customers!, need to be loud and obnoxious to sure our needs are being heard and acted upon. I think a better solution is to collect enough user votes to influence the development prioritization. Voting buttons are at the top left corner of the discussion. Out of interest which platform is being discussed here? MacOS App V7.5, at least that's my version. Hasn't hit Windows yet. Screen shot would be interesting. Ewwww, that is ugly. Thanks. EDIT: Not much better on Windows, but with the option to customize the toolbar you don't have to show it, which I don't. A﻿﻿ point for Windows﻿; you ﻿can customize the toolbar﻿﻿. When I switched from Windows to the Mac the first thing I tried to do was customize the toolbar to what I was use to and was surprised and mightily disappointed especially after seeing posts over the years about how superior the Mac interface was. The new design removed the Delete (Move to Trash) icon at the top right of a note and put it under the ... menu. Please put it back at the top so it is a single step tp delete, not several.